This cow has a wonderful pedigree and is an excellent cross with Purple Sage. She has been one of our top foundation cows and is an excellent producer. She has an Easy Street KK daughter, purchased by Terry Brown, Brown Brother's Cattle Company, Ripley, OH and a son of The Shadow, Shadow Jet, owned by Albert Imel, Princeton, KS. 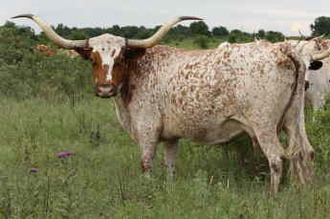 Her 2002 bull by Purple Sage, Purple Jet, owned by Langham Ranch, Houston, TX, placed 2nd in the 2003 Horn Showcase and missed 1st place by a mere 5/8". She has a fabulous 2005 Purple Sage bull named Sage's Reflection, that is owned by the partnership of Dakota Longhorns, Worthing, SD and Poppen Longhorns, Rochester, MN that placed 2nd at the 2006 Horn Showcase. We are retaining her Purple Sage 2006 daughter, Mirror Image, as a replacement. Whelma Jet is very gentle, loves range cubes and has a perfect udder. Her 2007 bull, Sage's Ghost Rider, was purchased by Duane & Lori Reichard, Rantoul, KS. She is an outstanding producer!